This is the seventh edition of the Rietumu Guide. Like previous editions, it contains topical information about the best hotels, restaurants, spa centres, beauty parlours, recreation centres, boutiques and art galleries. It also contains special sections with descriptions of interesting routes for independent travelling around Latvia and trips in its capital city, specially developed for readers of the Guide. The latest copies of the Rietumu Guide can be found in first-rate hotels and restaurants of Riga and Jurmala. Besides, any interested person can use a mobile version of the guidebook or download the application for iPhone or Android platform. All of the information provided in the Guide is fully original and absolutely independent. The Rietumu Guide is updated and supplemented annually. The current edition provides new ratings of top places in Riga and Jurmala, which are worth visiting when staying in Latvia. Separately, hotels and restaurants are listed, where discounts are provided to holders of Jurmala platinum card, which is available for Rietumu Bank clients. Readers will also find information here about the most remarkable concerts, musical and theatrical festivals of the year. Traditionally, important business data, information about transport, tourism agencies, medical services, etc. are provided as well. Those who arrive with children will like the special section “Riga and Latvia for Children”. The Restaurants section is useful for finding out about the places where one can try national cuisines of different countries, including France, Italy and certainly Latvia. In 2017 Rietumu Bank celebrates a double jubilee – the 25th anniversary of the bank and the 10th anniversary of its Charity Fund, which is the biggest private organisation of this type in Latvia. 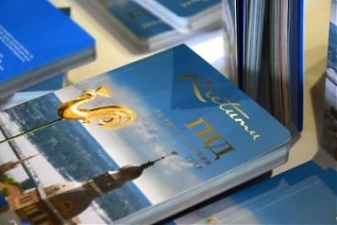 Several pages devoted to the bank’s anniversary provide information to the readers on the most significant facts from the history of Rietumu Bank, which during this quarter of the century has become one of the undisputed leaders of the finance industry in the Baltics. The Charity Fund section provides information about the support projects, events and places where Rietumu Bank has provided help. The Rietumu Guide is distributed for free. In addition to the best restaurants, hotels, points of sale and service in Riga and Jurmala, clients of Rietumu Bank can also receive the Guide in the bank.